Welcome to Maximum Flow Seamless Gutters, LLC! We are locally owned and operated and have provided quality seamless gutter services and repair to the Central Wisconsin area since 2001. We are fully insured and are a proud member of the Wausau Area Builders Association and the Golden Sands Home Builders Association. Maximum Flow's unique manufacturing process allows us to create both five and six inch seamless gutter systems on the job site. 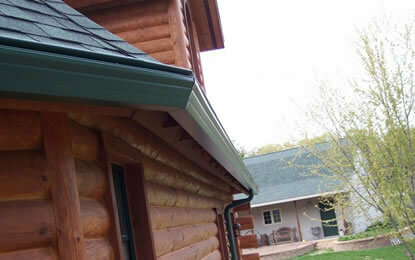 This ensures each piece of gutter we install is perfectly fabricated to fit and protect your home. Read our testimonials to hear how our customers feel about their new gutters! We are commited to excellence in quality and service. The materials and products we use are covered under a LIFETIME warranty. In addition, Maximum Flow warranties our labor covered by this agreement shall be free from defects under normal use and service.